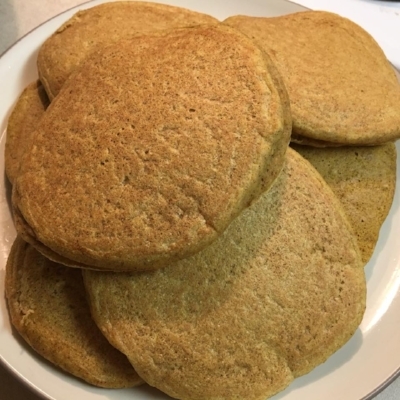 Try these great recipes using our organic, golden flaxseed and whole wheat flour! Place cookies on baking sheet and bake at 350 degrees for 12-14 minutes. Enjoy fresh out of the oven or frozen and thawed for a few minutes. Preheat oven to 350 degrees for 3-5 minutes (shut oven off). Heat 3 cups of water and pour into a 4 cup measuring cup or bowl. Add 2 teaspoons of honey, stirring until dissolved. Sprinkle yeast packets into water mixture, stirring until dissolved. Cover loosely with aluminum foil or saran wrap. Place 4 cup measuring cup or bowl with mixture into warm oven. Allow yeast to rise 15-20 minutes (until yeast bubbles are about one inch high). Sift twice- 8 cups of Askegaard Organic Whole Wheat Flour. Add 2 teaspoons of iodized sea salt. Mix and set aside. In large bowl, beat one egg. Add oil and honey. Blend well. Add yeast water mixture to egg, oil and honey mixture. Blend well. Add 1/2 cup sifted whole wheat flour. Blend well. Add in remaining flour. Turn dough on lightly floured board and knead until smooth and elastic. Place in large bowl (cover with wax paper or cotton dish towel). Set on top of warm oven. Let rise for 1 to 1 1/2 hours (until dough doubles in size). Punch down dough on floured board. Divide into 3 sections and place into greased baking bread pans (stoneware is a favorite). Cover with cotton dish towel and let rise for 30-45 minutes. Bake at 350 degrees for 30 minutes. Place on cooling rack for 5-10 minutes (in pans) and then remove from pans. Place bread on cooling rack. *Makes 2 large loaves or 3 medium sized loaves. Can also be used for buns. - Combine oats and chia in a glass jar (we use a 16 oz mason jar). - Pour the milk of your choice over the oats & chia. - Layer your favorite fruit on top. - Drizzle a tablespoon of honey (pure maple syrup, vanilla, or another natural sweetener can be substituted) on top of the fruit. - Sprinkle our ground flaxseed over everything in the jar. - Cover. Shake if desired, and refrigerate overnight for ~8 hours. - The oats will absorb some of the milk overnight. In the morning, add another splash of milk to the jar, mix, and enjoy cold! *Note: This recipe is very easy to modify & the possibilities for add-ins are endless. Make it your own, but always remember the most important ingredient- Askegaard Organic Golden Omega Flaxseed! - Mix together all ingredients. Chill in fridge (balls will be easier to form when chilled). Roll into bite-sized balls. Store in fridge. Makes approximately 15-20 balls. Using a hand stick (or upright) blender, combine 1 cup of coconut milk with 1/2 cup organic raspberries and blend until smooth. Add 1/4 cup chia seeds and stir. Refrigerate overnight (or for a minimum of 3 hours), until a gel-like consistency is achieved. Prior to serving, top with Askegaard Organic ground flaxseed and berries. If you'd like it sweeter, stir in honey, maple syrup, dark chocolate, or add a dollop of whipped cream! - Combine strawberries, raspberries, peaches, almond milk, yogurt, kale and Askegaard Organic ground flaxseed in a blender. Enjoy! In a blender, mix: Frozen Berries, Unsweetened Almond Milk, Vanilla Yogurt, Kale, and Askegaard Organic Ground Golden Flaxseed. Mix flour, sugar, baking powder, baking soda, cinnamon, nutmeg, oats & flax in a large mixing bowl. Fold in peaches. In a separate bowl, mix the eggs, milk, vanilla and applesauce (or vegetable oil). Add in the flour mixture and stir until combined. Fill muffin cups 2/3 full and bake for 15-18 minutes or until toothpick inserted comes out clean. Remove from pan and let cool on a wire rack. Enjoy! Mix above ingredients. Stir the mixture into the dry ingredients until just blended. Preheat oven to 350° and grease a loaf pan. Transfer batter to loaf pan and bake for 45 minutes, or until toothpick inserted into the center comes out clean. Remove from oven. After the bread has cooled for a bit, pour the glaze over the top. It will set, but remain slightly sticky. Enjoy! Directions: In a large bowl, dissolve yeast and ½ teaspoon sugar in warm water. Let stand 5 minutes. Add milk, ¼ cup sugar, salt, and shortening to the yeast mixture. Stir in egg and whole wheat flour; beat 2 minutes. Gradually add all purpose flour. Dough will be soft and slightly sticky. Knead until smooth and elastic – 10 to 15 minutes by hand or 10 minutes with dough hook. Place in a greased bowl; turn once to coat. Cover; let rise in a warm place until doubled in size. Punch down dough; cover and let rise again. Punch down dough again; cover and let rest 10 minutes. Mix topping ingredients together until smooth. Roll dough into a 12x16 inch rectangle and spread a thin layer of topping on the dough, leaving a 1 inch strip along one of the short edges uncovered. Brush the uncovered, 1 inch dough strip with water. Beginning with the short, topping edge, roll up, pinch to seal the un-topped edge and cut into 12 rolls. 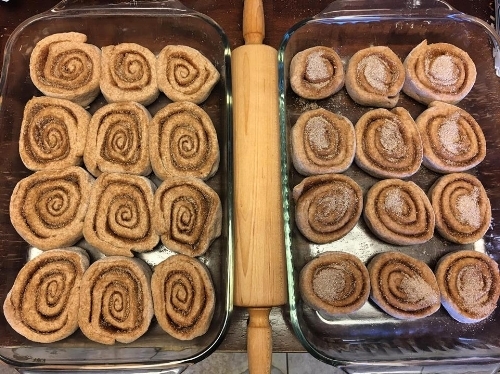 Place rolls in a greased 9x13 inch pan. Cover with a warm, damp towel; let rise in a warm place until doubled in size. Bake at 375° for 18 to 20 minutes or until golden. Directions: In a stand up mixer bowl, add flaxseed, ground flaxseed, flour, baking powder, salt, and margarine/butter. With the paddle attachment, mix on low speed until the mixture resembles a course meal. Stir in milk and mix until mixture forms a soft dough. Wrap dough in plastic and chill 10 minutes. Divide the dough into quarters. Turn out onto a lightly floured board. Roll out very thin into a rectangle (1/16inch) thick. Cut into desired shape (squares, circles, etc.). Transfer to an un-greased baking sheet. Repeat with the remainder of the dough. Bake at 325 F for 20 minutes or until crisp and golden. Variations: Add 1 tablespoon of onion soup mix, 1 cup of cheddar, mozzarella, or parmesan cheese, or 1 tablespoon of oregano. Directions: Place the wheat berries in a large pot. Add enough water to cover the wheat berries by 2 inches. Bring to a boil and cook uncovered for approximately one hour, or until tender. Drain and cool. Toast the walnuts in a dry skillet over medium heat for approximately 3 minutes. Walnuts will become fragrant. In a large bowl, combine the wheat berries, chopped walnuts, celery, cranberries, scallions, parsley, olive oil, and lemon juice. Season with salt & pepper to taste. Enjoy and refrigerate! Directions: Mix wet ingredients in a large mixing bowl. Combine dry ingredients in a separate bowl. Add dry ingredients to wet ingredients, blending until smooth. Pour batter, 1/4 cup at a time, into a hot frying pan. Brown pancake on both sides. Remove from pan and enjoy with maple syrup! Yields approximately 10 pancakes. Directions: Combine all ingredients in a large mixing bowl, blending until most of the lumps are gone. Heat 1 tablespoon of butter in a large frying pan over medium heat. Once the pan is hot, pour 1/3 cup of batter into the pan, swirling the batter into a thin layer that covers the entire bottom of the pan. You want the pancake to be thin. When the edges of the pancake begin to slightly curl, and the top no longer looks wet, flip the pancake to the other side. Aim to achieve a golden color on each side of the pancake. Additional butter may need to be added to the pan before starting a new pancake. Serve warm with jam, maple syrup, nutella, fresh fruit, honey, and/or powdered sugar. Pancakes are typically rolled, folded, or stacked. Enjoy! *Note* Try using Askegaard Organic Ground Flaxseed as an egg substitute! 1 tablespoon of ground flaxseed mixed with 3 tablespoons of water is equal to one egg. For even thinner pancakes, try using 1/2 cup all purpose flour and 1/2 cup whole wheat flour, or add more milk. Directions: Preheat oven to 375°. Line muffin pan with paper cups. Toss peeled, diced apples with cinnamon & sugar. Set aside. In a large bowl, mix the flour, sugar, flaxseed, baking powder, baking soda, salt, cinnamon, and all spice. Make a well in the flour mixture and add eggs, vegetable oil, and vanilla. Mix well. Fold in apples. The batter will be thick. Pour mix into muffin cups, 2/3 full. Mix melted butter, brown sugar, flour, and cinnamon. Sprinkle on top of the muffins. Bake for 18-20 minutes or until tops are golden brown & toothpick inserted into center comes out clean. Remove muffins from pan and cool on wire rack. Optional: Mix powdered sugar with milk, almond milk, or cream. Drizzle on top of the muffins as icing. A versatile recipe that results in a chewy, dense cookie featuring flaxseed and whole wheat flour! Heat oven to 375°. Cream the nut butter, agave nectar (or honey), and sugar until well blended. Add the flax, milk, and vanilla. Mix. Combine the oats, flour, and baking soda in a separate bowl. Slowly add the flour mixture until a thick batter forms. Stir in the raisins. Scoop dough onto cookie sheet and bake for approximately 10 minutes. Remove from oven, cool for 5 minutes. Whisk together olive oil, vinegar, mustard and honey in a bowl. Toss with salad greens, apple slices, wheat berries, and nuts/berries. Serve chilled. “Wheat berries” are the seed of wheat plant. High in protein, fiber, & micronutrients, they are a whole grain worth adding to your diet! Wheat berries are prepared much like rice. To cook wheat berries, simply place 1 cup of wheat berries and 3 cups of water in a pot on the stovetop. Bring to a boil. Cover and simmer over low heat for approximately 30 minutes, or until the wheat berries are soft (they will “puff” and have a chewy consistency). Drain and cool. Cooked wheat berries can be stored covered in the refrigerator for up to a week.